Reservoir keeps water flowing to irrigators, N.M.
Trent Taylor raises alfalfa and grain north of Redmesa. While La Plata County is in an exceptional drought, irrigators in western La Plata County received more water than they expected because of the Long Hollow reservoir. The La Plata River dried up in May when runoff from snowpack would normally have been making its way from Hesperus to the New Mexico line. The dry river bed near Breen is a stark reminder of the worsening drought. 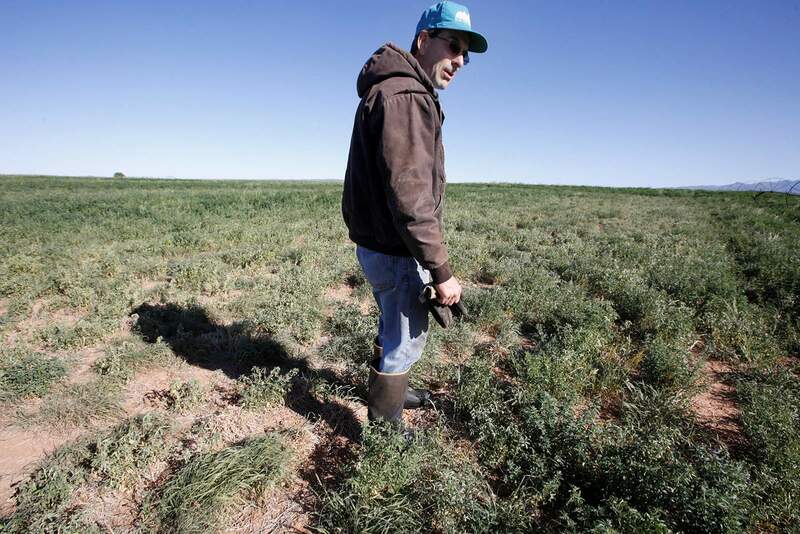 “There is nothing growing out here except a few acres of alfalfa,” said Pat Greer, a rancher in western La Plata County. Sections of the La Plata River go dry every year, but typically it starts to happen in June, said Rob Genualdi, division engineer for the Colorado Division of Water Resources. Releases from the Bobby K. Taylor Reservoir on Long Hollow Creek have kept the river running across the New Mexico line, he said. 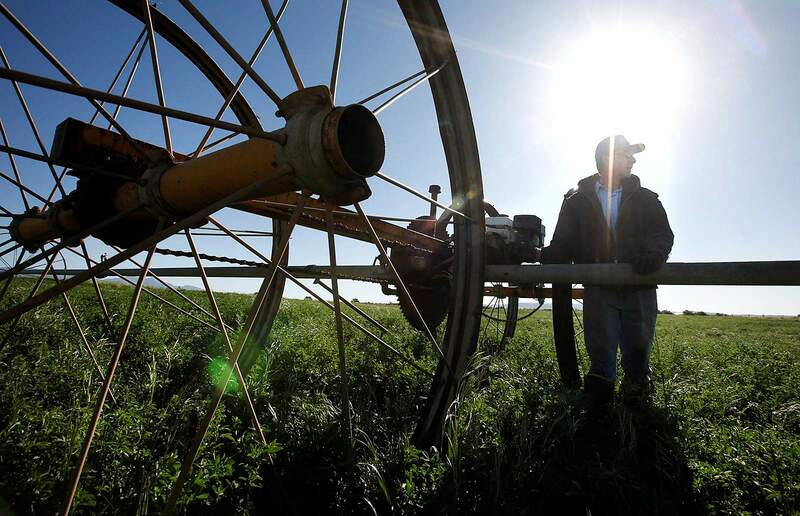 The 3-year-old reservoir has also offered irrigators some reprieve early in the growing season, and a new domestic water service will offer a long-term water source to some domestic water users who have struggled with declining groundwater. While drought conditions are rivaling what western La Plata County residents faced in 2002, releases from the new reservoir have kept water flowing to irrigators in New Mexico, and it has allowed more farmers and ranchers to use water from the La Plata River. “It’s way better than we would have historically expected in a year like this,” said farmer Trent Taylor, who raises hay and grain. Trent Taylor said last year his alfalfa and grass mix was thick thanks to good moisture. But this year, it is almost bare in places because of the drought. Taylor farms north of Redmesa in western La Plata County. The reservoir south of Redmesa allowed irrigators to use La Plata River water that they would otherwise have to leave in the river to fulfill a compact with New Mexico. Half of the water in the river at Hesperus is required to be delivered to New Mexico the next day under the compact, Taylor said. Now, Long Hollow water can be exchanged for water in the La Plata River and less water is lost to evaporation and percolation on the 25-mile journey to the state line, Taylor said. The La Plata River dries up annually, and farmers and ranchers don’t typically receive irrigation water after June, said Roy Horvath, a La Plata West Water Authority board member and an HH Ditch board member. At the same time the irrigators are benefiting from new infrastructure, La Plata West Water Authority is working to bring reliable domestic water to residents. La Plata West Water Authority plans to bring water to the area via a pipeline between Lake Nighthorse and Lake Durango, and it is almost complete, Horvath said. The authority is requesting bids to start construction of the first phase of the project now, he said. The first phase of the project is expected to serve more than 140 residences, said Mardi Gebhardt, the authority’s treasurer. The drought is also likely to prompt more residents to sign up for the water service, she said. New customers pay $12,000 up front to help cover the cost of constructing the new water system, Horvath said. The first phase of the project is expected to cost about $4.45 million. Water user sign-up fees, a grant and a loan will cover the cost of construction.